Acts of violence in India and all over the globe glaringly proclaim the low threshold of the tolerance level prevalent in the current times. What is even more disconcerting is that, most of this violence erupts ostensibly on communal and religious grounds. This is truly tragic ! No religion preaches violence or encourages the killing of fellow man. Yet this is what we witness inspite of mankind having scaled extraordinary intellectual heights in the fields of technology and science. Neale Donald Walsch in his book “Conversations with God – Book 2 An Uncommon Dialogue” highlighted 2 ways – one material and the other spiritual to stop wars and bring about global prosperity and happiness. “In 1994 the world’s governments spent about one trillion dollars for military purposes. That’s a million dollars a minute worldwide. If the war machinery was shut down, these monies could be used to feed the hungry, clothe the needy, house the poor, bring security to the elderly, and provide health care and dignity to all on this planet”. “Not needing” is a great freedom. It frees you from fear; fear that there is something you won’t have; fear that there is something you have that you will lose; and fear that without a certain thing you won’t be happy. “Not needing” also frees you from anger. “Anger” is fear announced. When you have nothing to fear, you have nothing over which to be angry”. Sindhis are traditionally tolerant, non-violent and peace loving people. I believe this is an inherent characteristic trait within a community that was greatly influenced by Sufism, which propounds LIFE IS LOVE. LOVE BREEDS TOLERANCE AND TOLERANCE BREEDS PEACE. 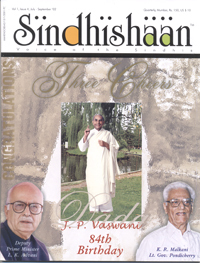 So in this spirit of Love & Peace, Sindhishaan dedicates this issue to Dada J.P. Vaswani who truly epitomizes this spirit of love. Love not only for all of mankind but for all fellow creatures inhabiting planet Earth – The spiritual way to stop wars. Salute to Dada J.P. Vaswani on his 84th birthday – this 2nd of August, and to Shri L.K. Advani – ‘Shaan’ of the Sindhi community and Jewels of the Nation.